Tired of heading to a restaurant with your friends on a rare ladies’ night out?? 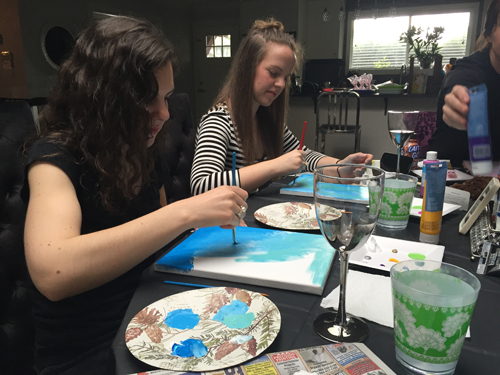 Why not have a ladies’ night in and a few hours of laughs, painting and a good time! When one of my girlfriends said we were getting together to do some painting, I was hesitant. I am NO artist. I have friends who can draw and paint beautifully, and there was no way that I was going to sit and make an attempt at painting something and have theirs look beautiful. And really, who wants to paint anyways! But after those thoughts went out of my head, a night out is a night out! Even if the painting did not go well, there was still wine and appy’s and some kid free time with my oldest friends! Well let me tell you how WRONG I was about my WORRIES! The theme our host chose was mermaids. We watched a bit of a you tube video about painting for a couple minutes and then we were off! We tried not to peek at each other’s creations, and decided that our goal was not to copy the artist’s rendition exactly, but use it as the basis to create our own mermaids! We painted, laughed and snacked for an hour and a half, before setting a “five minutes left” timer. We then showed off our work, each complimenting each other’s distinct style. While you can probably pick out the artists in the group, everyone seemed to love something about each other’s work! It was a super positive time, where even those who hate receiving compliments (ie ME) were proud of their work! We finished off our wine and appys and headed out for dinner to continue our kid free evening! All of the supplies can be purchased at local craft stores and even dollar stores. You do not need to go out and spend a fortune on supplies! 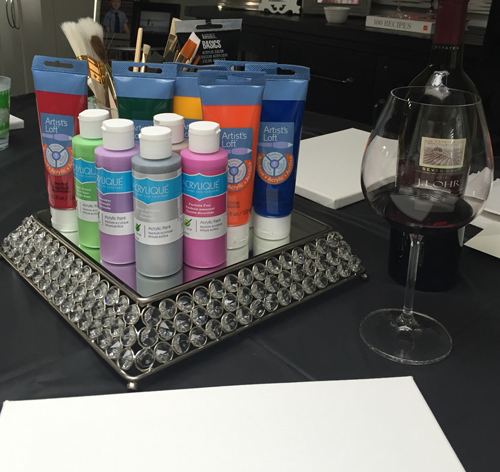 And once you have the supplies, you will have lots of evenings of painting ahead!